Improve your swimming technique… Train with a center mount snorkel. 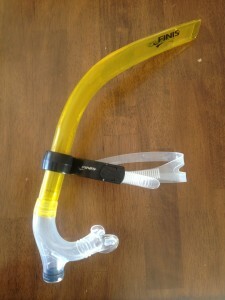 Recently I returned to using a center mount snorkel for part of my swim sessions in the pool. I forgot how much fun this is when air is always available & also realized that my stroke needs some tuning up. Typically I will start with it during warm up swimming 2-300 yards at an easy pace. Then, gradually building the distance on some shorter sets as I get used to flip turns again while not swallowing water coming back to the surface. I have also been incorporating into my cool downs to help me refocus on my technique before ending the training session. Here are some of the things I like about training with the center mount snorkel. Swimming: First and foremost, it allows the athlete to focus on technique without having to turn the head to breathe. Often times, breathing strokes will cause a swimmer to become unbalanced in the water causing them to wiggle from side to side or worse yet, compromise body position with sinking hips, legs and feet. With the snorkel the swimmer is able to keep their head in a neutral position, working on good body alignment and balance in the stroke. Athletes with breath timing issues can learn to time their breathing without turning the head. A great drill for this is 4 x 25 rest :10 seconds with snorkel timing your exhale to the pulling arm you wish to breathe on. Then swim 1 x 50 without the snorkel breathing to pulling arm side you just practiced. Repeat 2-3 more times. Kicking: With the snorkel, like swimming allows the athlete to maintain good body alignment and can reduce stress put on the lower back if kicking too much with a kickboard. Beginners can start with 4 x 25 flutter kicking rest :10-15 seconds. Arms stretched out overhead at shoulder width holding onto the bottom of a kickboard to help stabilize. Once this skill is acquired then try the 4 x 25 without the kickboard arms stretched out overhead at shoulder width or in a streamline position. Drills: I like to do what I call a progression scull. This is where the athlete starts in the front scull position, arms stretched out in front at shoulder width 14-18 inches below the surface of the water. Start with some gentle sculling movements then gradually progress the scull through the freesytle pulling pattern until you reach the finish of your stroke. Like above 4 x 25 on 10-15 seconds rest will do and then swim 1 x 50. If done correctly, you should really feel a good connection with your hands to the water. Single arm swimming is also good with the snorkel as it allows the swimmer to coordinate hand/arm speed through the pull to their hip speed. Doing single arm pull with the non-pulling arm stretched out in front is a good way to start. I like this position as it allows the swimmer to feel a nice long body line from finger tips, through shoulder to hip. Also, since you don't have to breathe, you can pay attention to that lead arm when pulling to make sure it is not crossing center, the elbow is dropping or exhibiting other deviant behavior. If you have not used a center mount snorkel before, I highly recommend giving it a try. Typical cost is between $30-$40. Be patient as you get used to breathing with the snorkel. Keep the repeats short so you can keep the technique focus at a premium.